Those were the words of Mike Sullivan on Dec. 12 of last year, after it was announced that he would be taking over the job as head coach of the Pittsburgh Penguins. Those words summarize the Pens’ 2015-16 season: a collection of players that bonded together to overcome remarkable adversity and conquer the entire National Hockey League. “The challenge is to take a group of great players and become a great team.” The Pens set out to become a great team. Along the way, they became the greatest team. There is no denying that fact following their 3-1 victory in Game 6 of the Stanley Cup Final against the San Jose Sharks at SAP Center on Sunday night. "I can't be more proud of them the way we came together as a team," Sullivan said on the ice following the win. "All I could think of when the guys were celebrating and raising the trophy was how this group of players has come together over the last four months to become one really good hockey team." On this night, the Pens won their fourth Stanley Cup championship, and exactly seven years to the day of winning their third title. Sidney Crosby, Evgeni Malkin and Kris Letang have delivered the city a second Stanley Cup championship, just as the likes of Mario Lemieux, Jaromir Jagr and Ron Francis before them. The legacies of the team’s core players will be enshrined in Pittsburgh sports’ history and etched, once again, onto the side of the NHL’s holiest chalice. However, this outcome seemed unlikely just a few months ago. But even on that December afternoon, when many in the hockey world, many of the team’s own fans and possibly some in the locker room and within the organization had written the season off as a failure, Sullivan believed. "I saw championship potential and I told our guys that," Sullivan said. Maybe it was naiveté. Maybe it was blind faith. Maybe even stubbornness. Whatever it was, Sullivan had a deep conviction that when he first stepped into the locker room that he would be walking into a room full champions. Much has already been written, and rightfully so, about the Pens’ turnaround. From establishing a new identity built on speed, compete and resiliency. Much has already been written, and rightfully so, about the Pens’ mental evolution from a fragile group to one with an unwavering focus and attention to detail. Much has already been written, and rightfully so, about the adversities this team has overcome as a group, climbing out of a deep hole in the standings, transforming from a pedestrian offense into one of the league’s formidable powerhouses. But the greatest story of all has been this great group of players becoming the best team in the NHL. All championship teams are really just a group of men making individual sacrifices for the betterment of the group itself. Just look at the decision on who should have been voted as the Pens’ playoff MVP - which was awarded to Crosby. An argument could have been made for Phil Kessel. After all, he led the team with 10 goals and 22 points. He was the team’s most consistent producer all postseason with points in 16 of 24 games. Kessel was his best when the team needed him the most – notching two goals and setting up the series-winning overtime tally in Game 6 against the President’s Trophy-winning Washington Capitals. Matt Murray became just the fourth rookie goaltender to lead his team to a Stanley Cup championship. Along the way his 15 playoff wins tie other rookie netminders Patrick Roy (1986), Ron Hextall (1987) and Cam Ward (2006) in NHL history. Throughout the team’s run, Murray was a rock in-between the pipes. His cool approach had a calming effect on the team. More importantly, he stopped the puck. But Kessel wouldn’t have enjoyed the same scoring success without the help of his linemates. And Murray wouldn’t have been as strong in goal without the help from his defensive corps. While those two may stand out, the contributions to this championship squad came from top to bottom. 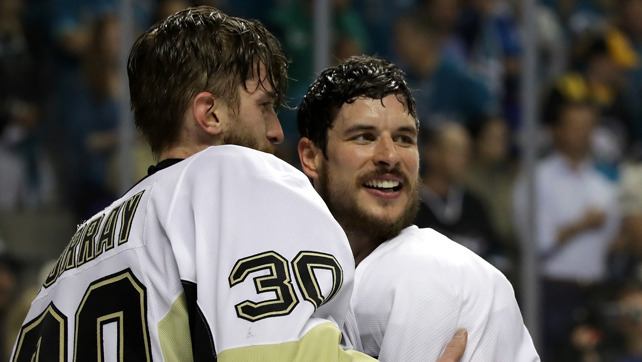 The team’s captain, Crosby, notched three game-winning goals during the Eastern Conference Final against Tampa Bay. And he even choreographed the game-winning overtime play off of a faceoff win in Game 2 of the Cup Final against San Jose. And after blocking a shot he set up Patrick Hornqvist for the third goal of Game 6, the dagger, that sealed the Cup title. Malkin missed 25 of the Pens’ final 33 regular-season games, including the final 15, with injuries. He returned to the lineup after missing the team’s first playoff game and has quietly produced points while helping the team use four formidable lines. He notched two goals and four points in Game 4 against the New York Rangers. He scored the game-winning power-play goal in Game 4 in San Jose of the Cup Final to push the Sharks to the brink. Letang has been everything the Pens needed on the blue line. He’s led the way in ice time, playing in every situation, while being a steady and reliable presence on the ice. Letang’s ability to single-handedly skate the puck out of danger in the defensive zone and his breakout passes have allowed Pittsburgh to play the speed game it desires. Maybe the breakout star of the postseason has been center Nick Bonino. He scored arguably the most memorable goal of the postseason when he eliminated the Capitals in Game 6 in overtime, sending the bench, his teammates and crowd into a frenzy. Bonino has also played a huge role on the penalty kill and has left a few games after blocking a shot, only to return shortly after and finish the game. No player more defines passion than Patric Hornqvist. Whether it’s taking a beating in front of the opposition net, blocking a shot with his head or scoring a hat trick, Hornqvist has been the heart and soul of this playoff run. He will finish this postseason with a bruised and beaten body, but no one deserved to raise the Cup more than Hornqvist. Chris Kunitz was a leader on the ice and in the locker room. He was a physical presence on the ice, but also chipped in offensively. Kunitz had a three-game goal-scoring streak in the East Final against Tampa Bay, and carried a six-game point streak (3G-4A) over into the Cup Final. Matt Cullen, the father of the team, won his second Stanley Cup at the age of 39. His character and leadership filtered throughout the room. 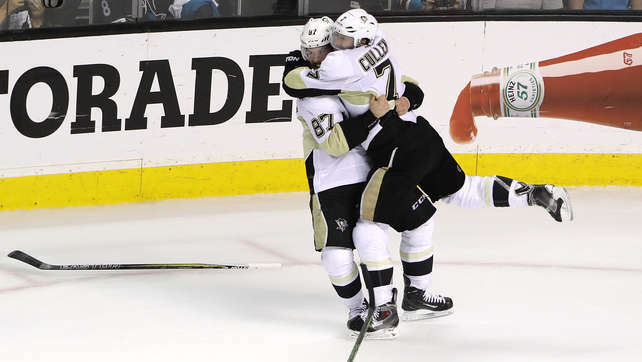 The Pens coaching staff leaned on Cullen in defensive situations and faceoffs. He delivered every time. Carl Hagelin’s speed has completely changed the dynamic of the Pens. His ability to win every foot race gives the Pens the option to dump pucks into space and escape danger, knowing Hagelin will track it down and regain possession. None of the Pens’ playoff opponents could defend against his quickness. Bryan Rust set a team rookie record by scoring six goals. He was the team’s Game 7 hero against Tampa Bay by posting two goals in the 2-1 win. He also notched two goals in Game 5 of the First Round against New York to eliminate the Rangers, becoming only the second rookie in NHL history to record multiple goals in two series-clinching games (Jeremy Roenick, 1990). Conor Sheary had to overcome a knee-on-knee hit from Tom Wilson, one in which the Caps forward was fined. Sheary’s speed and game suffered, to the point where the coaches sat him. But he never complained or made an excuse. His health improved, his game improved. Sheary scored the game-winning overtime tally in Game 2 against San Jose. 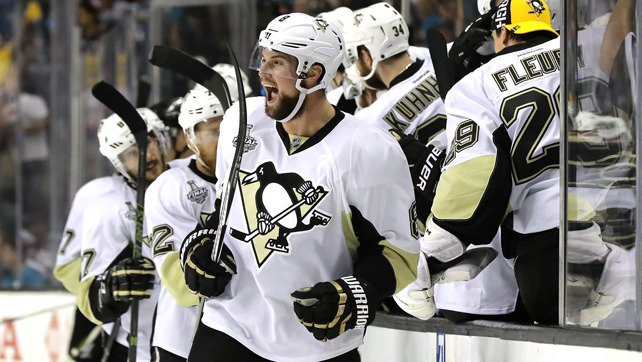 Brian Dumoulin transformed into the team’s most consistent and reliable defenseman. Ben Lovejoy slid over to block a shot that would have been a goal against Washington. Tom Kuhnhackl, who can barely walk off the ice, gave everything he had on every shift. Ian Cole went from a healthy scratch in the regular season to the team’s most physical and best penalty killing defenseman. Eric Fehr scored two game-winning goals and a dagger goal in Game 4 against San Jose. Trevor Daley being a veteran presence and jolting the team’s speed. Justin Schultz stepped in when Daley went down and excelled. Olli Maatta battled through an injury that has limited his skating ability. He had to adjust his game to accommodate, basically relearning how to play the game. All the while telling the media that he had no issues and making no excuses. Marc-Andre Fleury, who has been the ultimate team player this postseason. Instead of sulking about being a backup despite being the No. 1 guy all year long and having already won a Cup ring, Fleury has been Murray’s biggest cheerleader. Instead of dividing the locker room and creating friction, Fleury has brought the team together and has given Murray the guidance the young netminder needed. Or Jeff Zatkoff, who helped Murray develop last year in the American Hockey League. Who was pushed to the No. 3 goaltender on the depth chart, but didn’t sulk. And when he was called upon, starting in Games 1 and 2 against the NY Rangers after going nearly two months between starts, to make 35 saves and net a victory. Or even Pascal Dupuis. Despite leaving the game that he loves in December, Dupuis has stayed around and helped out in any area in which he could. He’s the team’s biggest cheerleader from the press box and the first to offer advice and assistance and guidance. And not being able to play is killing him. But he still suffers it every day, because he’s doing it for the team. That isn’t to discount the contributions from Beau Bennett, Derrick Pouliot, Oskar Sundqvist, Kevin Porter and Scott Wilson. This was a full team effort. This was a full team achievement. These players are champions. “This is the players’ game. The players are the guys that get it done. They deserve the credit,” Sullivan said. That is true. But this wasn’t just about the players. Everyone from the training staff to the medical staff to the equipment staff did their part. The coaching staff, led by Sullivan, and including assistant coaches Rick Tocchet and Jacques Martin, goaltending coach Mike Bales and defenseman development coach Sergei Gonchar all deserve high marks. Sullivan’s contributions are obvious. It may have been a serendipitous union. No other coach in the National Hockey League could have mastered this turnaround. His presence commands attention. His voice commands a room. When he talks, players listen. Sullivan spoke. The players listened. Sullivan led. The players followed. And together, they all became champions.